As part of a major community service effort in December and January, 190 employees from WebMD in several U.S. cities took part in F-to-F’s “Bath Pack” project, putting together an impressive 950 personal care item kits for struggling families in need. 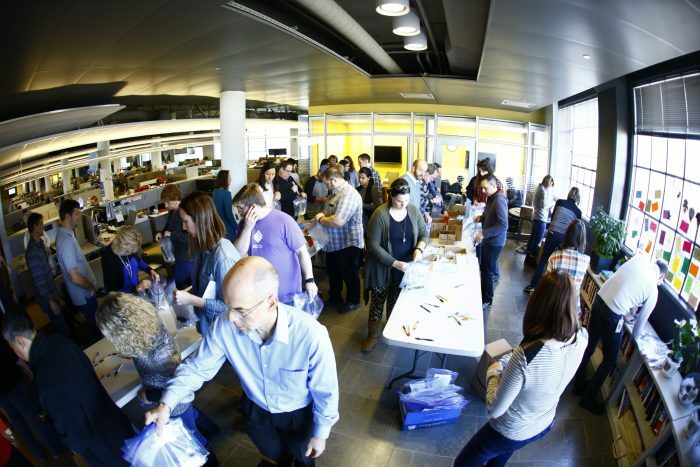 120 employees in Indianapolis (Indiana) and another 70 in Portland (Oregon) assembled the kits, which each included shampoo, soap, toothpaste, a toothbrush, deodorant, a comb and a list of WebMD wellness tips. The hygiene products for the kits were donated by High Ridge Brands, MetLife Dental Division, Hillsboro Implants & Periodontics, WebMD Cares and SC Johnson. Completed “bath packs” were delivered to local social service organizations. In addition, WebMD employees volunteered at the Portland Rescue Mission to serve breakfast to over 150 homeless, where they distributed more of the personal care item kits. A group of employee “angels” at Dannon in White Plains, N.Y. put together a whopping 270 “dinners in a bag” for impoverished local families over the holiday season. Using Family-to-Family’s “Let’s Do Dinner!” project as a template, Dannon chefs provided recipes for healthy dinners to Dannon employees, who then shopped for the recipe ingredients and assembled the ingredients into bags during several half-hour “meal packing competitions.” Each bag contained all ingredients needed for a full meal for a family of five, plus a copy of the printed recipe. The bags were delivered to six Westchester County, N.Y. nonprofits that work with families in need (all affiliated with the social services agency Westhab, Inc.), enabling local families to cook a healthy dinner meal from a new recipe! In an ongoing effort to help local families in need, employees from Stew Leonards grocery store in Yonkers, New York took part in another Family-to-Family project over the holidays (in the past they’ve participated in both our summer backpack and children’s book drives). This time store team members put together baskets of holiday groceries for families in need through F-to-F’s Holiday Dinner Baskets project. The baskets were delivered to the nearby Hastings on Hudson, N.Y. community food pantry, where they were given out to some of the 30 families the pantry serves each month. 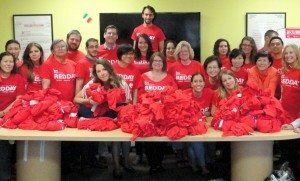 “Had a great day stuffing t-shirts… This project was a great choice for us!” Carol Vigorito of Keller Williams Realty and her company’s team of realtors in Queens, New York made and donated 121 “Stuffed Shirts” at their annual “Red Day” giving event on May 14th. The t-shirts, which were filled with basic hygiene items like shampoo, soap and toothpaste, were delivered to Queens Community House, where they’ll be given out to families struggling with poverty.